In a Nut Shell: If you want a crisp, easy-drinking [and cheap] lager, it’s hard to do better than Yuengling. Review: It’s hard for me to be objective about this beer, but I’ll do my best. It pours a beautiful medium-amber color with good carbonation but very little smell. It’s got clean, biscuity cereal grain flavors; it’s low on hops and well balanced. Even using my most stringent beer-criteria, I really can’t find much to criticize here. Traditional lagers are frequently a fairly uncomplicated beer style, and this is no exception. But it’s flavorful, delicious, refreshing – everything about it rubs me the right way. Is the most amazing beer in the world? Or even the best and most perfect incarnation of a lager? Probably not. But is it a great beer for a lazy afternoon? 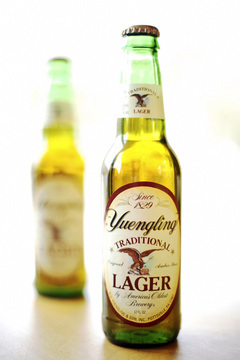 At 4.4 % ABV and a price pretty close to Miller and Bud, it might be the perfect beer for a lazy afternoon – especially in the Mid-Atlantic, where Yuengling will always be king. It’s as American apple pie, baseball, and well, beer. Rumor has it, it’s even President Obama’s favorite brew. What’s more American than that? Yuengling is crap. Having grown up in the area and having the shite forced on me for years, I do not see the love for this beer. For a Macro I guess they’re OK, but Sam Adams is far superior.